Chelmsford Great War Memorial contains names of twenty-two men who themselves or whose immediate families lived in South Primrose Hill, Chelmsford during the war. This represents a disproportionately high number of fatalities bearing in mind the street, a typical Victorian road half a mile west of Chelmsford Station, only contained 83 households during the war. One terrace of ten properties has four commemorated men - another of 24 has thirteen commemorated. They include one set of three brothers (Staines) and three sets of two brothers (Brown/Cox-Brown, Harris and Woodyard). Five died after the war - three of whom are not officially recognised by Commonwealth War Graves Commission. 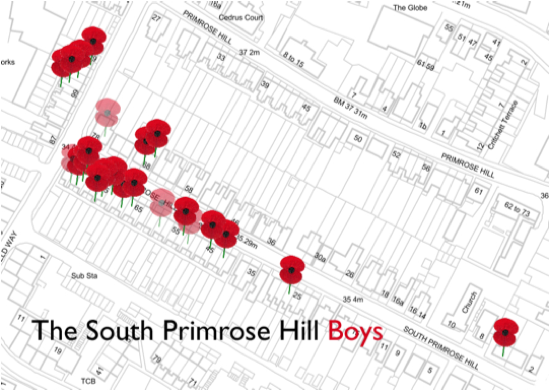 Several other men whose families had left South Primrose Hill before the war are also commemorated by the memorial.